Last night’s stitching was Butterfly Rest. I almost got the first little blossom done. I absolutly love the colors in this piece:) I am so glad I picked this one up again. 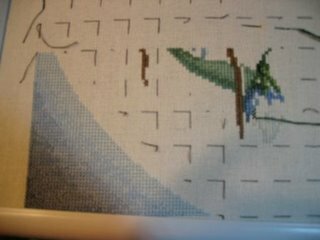 I wish I had time to stitch on M9 today, but we are getting ready to head down to Allen’s grandparents this afternoon. Soooo, hope everyone has a wonderful weekend! See you on Sunday night. All your pieces are looking great. I especially love Woodland Fairy. Thanks for dropping by my blog and commenting – now that I have found your I will be working my way over to look at your beautiful stitching! I love how your going with Mystery 9! What fabric are you using if you dont mind me asking? – its just gorgeous! Your WIPs look great. Keep us updated on the progresses. You are off to a great start Leslie! Last month you had a Poll counter in your side bar, how did you set that up? I want to set one up but don’t know how to. Thanks in advance for any help you can give me.